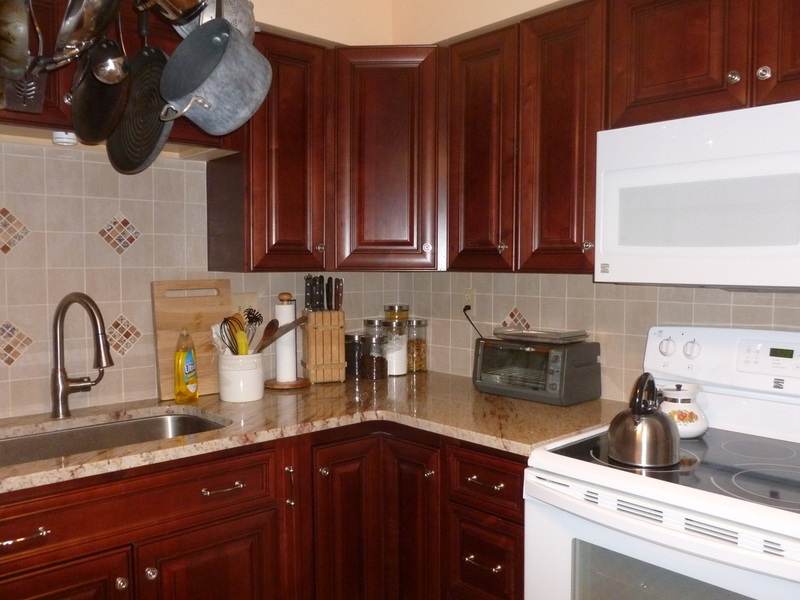 AlteCocker's newly redone kitchen prominently featured on her home exchange pages. Staged photo, of course. Please note lack of visible crumbs. This is not really a competition. Recently a permanent traveler who travels via serial house sitting wrote a piece on methods of cheap travel. When AlteCocker pointed out that she had totally omitted home exchange, the person claimed that house sitting was identical to home exchange. AlteCocker thinks they are two separate methods of traveling. Let me tell you why. House sitting appeals to a devoted coterie of folks who have sold their possessions and have some sort of job that enables them to travel full time. A smaller number use it for vacation travel. There are, based on websites, fewer people involved in house sitting than home exchanging. The main website for house sits appears to be Trusted House Sitters. The person writing the piece and AlteCocker had an exchange of emails over her piece where AlteCocker objected to her glaring omission of home exchange. AlteCocker was accused of saying that home exchange was "better" than house sitting--which she never said. She said only that they were different and omitting home exchange from the piece was an error. The person writing the piece then claimed that half of her house sits did not involve pets. So, AlteCocker dSecided to do some research. Was she missing something here? Should she be trying to house sit as well as home exchange? The answer for AlteCocker is a resounding "No!" Well, despite what Suitcase Stories said in her conversation, the main people who look for house sitters are mostly looking for pet care. In fact, if you click on the link for Trusted House Sitters above, the first thing you see is the sign up page encouraging people to sign up so that people can house sit their pets while they are away. Further discussions with other house sitters revealed that pets are usually part of the deal in a house sit although some house sits come without them. House sitting can appeal to people who don't have homes to exchange--e.g., long term travelers who have sold all their possessions or young people who have not settled into careers yet. One person even wrote a guide to how he funds his alternative lifestyle of long term travel--something most people doing this do not discuss. He travels with a child and says other families do this as well. While no doubt his child receives educational benefits from seeing the world, schooling is a real question for any family doing this. I suppose that many use a home schooling curriculum. If children have to integrate back into "regular" school at some point, there could be problems. Since AlteCocker never did this, however, she is no expert. A blog is being added to this page in hopes that some house sitters will weigh in with comments. Another category of people looking for house sits might be retired people looking for alternative vacations--very similar to home exchangers. To do this successfully you would have to appear to love pets. If you don't love pets, your options for house sitting would be severely reduced. Home exchange is used almost exclusively by people looking for vacations. Most of the exchanges are done in July and August, the usual months for Northern Hemisphere vacations (creating problems with exchanges in the Southern Hemisphere because the seasons are reversed). Some home exchangers have second homes (AlteCocker does not) which enable them to do nonsimultaneous home exchanges creating more opportunities. The bottom line is that home exchangers have homes--which makes them very different sorts of people from the long term travel type of house sitters. While there are a few requests for long term home exchanges on the home exchange sites, AlteCocker's experience with this is that, if you want to travel long term, you need to put a series of home exchanges together. AlteCocker has traveled up to 10 weeks. For the 10 week trip she had 3 home exchanges, one hospitality exchange and 5 nights in hotels. House sitting is a business arrangement between the sitter and the home owner. Home exchange is a mutual trade of residence usually from 2 days to 4 weeks. In 51 exchanges AlteCocker has never had a home exchange of more than 4 weeks. Recently, someone from Denmark inquired about a 6 month home exchange. AlteCocker told the woman she would have to put a series of swaps together and offered the woman a week's home hospitality if she ended up in the Washington, DC, area (AlteCocker was not interested in that deal herself). The insurance in home exchange is that it is mutual. They are just as worried about their possessions as you are about yours. In home sitting there is no mutuality. In AlteCocker's view, it is the mutuality that creates the insurance. AlteCocker is not going to pass judgment on whose system of travel is "better" because both systems are equally valid. However, it is a heck of a lot easier to do a home exchange if you do not require pet care--making that one factor very different from house sitting where the odds of getting a house sit are much higher if you love pets. Maybe some home exchangers who love pets might have better luck with house sitting than they do with home exchange, but the whole pet business is why AlteCocker will never do it. In any event, in AlteCocker's view, house sitting and home exchange are not the same thing. And, since more people appear to home exchange than house sit based on what AlteCocker saw online, no piece on alternative methods of travel should omit home exchange because someone involved primarily in house sitting thinks they are the same thing. The mere fact that they appeal to different sorts of people is enough to make them different. Whatever you decide to do, enjoy your travels!